Remember the 90s and how nonchalant the punk scene was? It was just a bunch of angsty musicians from small town suburbs sticking it to the man. The psych vibe of the late 80s is almost identical to this ideal of carefree, relaxed sounds, and both stayed away from each other in separate corners for the most part. However Montreal’s No Joy took these two genres, mashed them together and threw in some techno pizazz and created a follow up to their 2010 debut LP entitled Ghost Blonde. 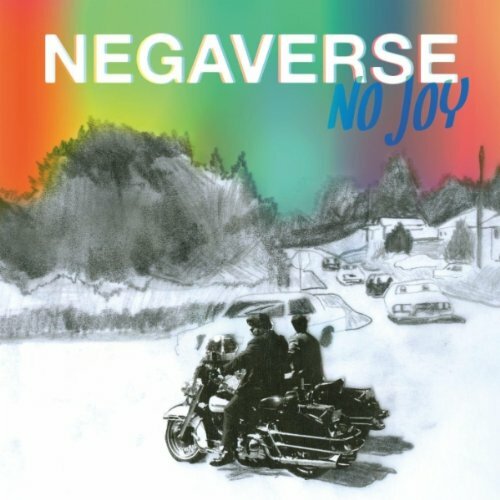 Their new EP Negaverse (release June 19, 2012) holds true to the sound that No Joy has been described as many times before; alternative-punk-noise-shoegazing-psychedelic … rock. But whatever the kids are calling their music today is irrelevant because people make their own judgment and will surely find at least a dozen more subgenres to peg onto the list. In any case, Negaverse is really more like a collage of hazy retro sounds, painted over top with typical rock riffs. Eventually the tunes shift the gears of No Joy’s version of punk-rock, altering the archetypal sound of angst into art. But once you get past the opening tack “Junior” (and take the term “shoegazing” to a literal level) you can expect more even more of their effects-pedal sound and vocals to carry you off to a hazy place. And if you were a 90s kid or teen, you might even find yourself trapped in the Negaverse with Negaduck after playing the EP on repeat a few times (both terms used in the alternate universe arising out of Disney’s Darkwing Duck circa 1991 – 1992). In short, the best way to listen to Negaverse (or rather experience it) is to create your own negaverse, either by reverting back to the mindset of the 90s (cartoons or punk scene) or have a few too many, lay on a flat surface, and stare into oblivion.